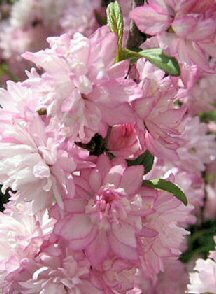 The Flowering Pink Almond is prized for heavy flowering in early spring. Branches literally covered with densely packed double pale pink blooms. It has attractive glossy foliage during growing season. Deciduous. Keep outdoors. 8 years old, 17" - 19" tall. Flowering outdoor deciduous bonsai tree grown and trained by Bonsai Boy.